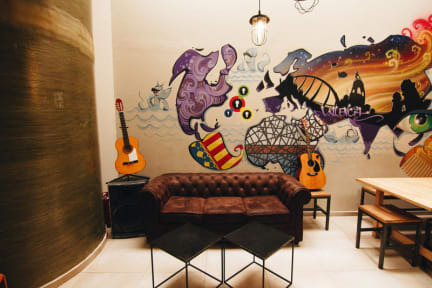 Purple Nest Hostel Valencia kohteessa Valencia, Espanja: Varaa nyt! Pros: friendly staff who made effort to make atmosphere social during quiet Xmas time. Perfect for solo travellers, even if a bit like a party hostel. Good wifi and hot showers as well as clean kitchen. Cons: Noisy hostel. By bed was squeaky (some beds seemed newer and probably silent as well). Thin windows as anywhere in Spain; traffic noise and cold air came into room (but there is a blanket). Thin walls too. Loudest noise was the water heater (?) which sounded like loud foghorn in your room!